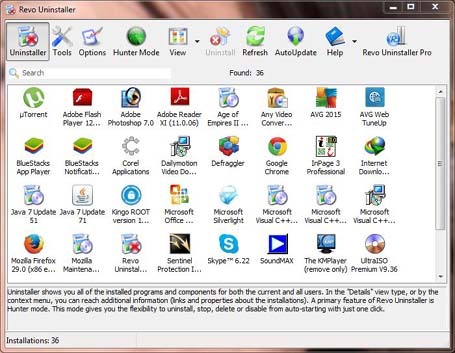 Free download Revo Uninstaller latest version 3.1.8 of Free and Pro editions. Revo Uninstaller is a system utility program developed by VS Revo Group and published in two editions as Free and Pro. The free edition was released on July 4, 2013 with a version of 1.95 while the Pro edition with the version 3.1.1 was released on October 2, 2014. Revo Uninstaller is a utility software used to uninstall the applications, programs, games or other utilities installed on windows operating systems. The key advantage of Revo Uninstaller is that it uninstalls the application completely from the windows, with all of its components and registry files. The stock uninstaller of the windows does not uninstall the software completely as the registry files are not deleted. This is why when we install some program and uninstall it because of some error, and then reinstall the program, the error remains as it was due to always existing registry files. Revo Uninstaller will now fix this problem for you. Revo Uninstaller has four different modes to uninstall any software. The modes are named as Built-in, Safe, Moderate and Advanced. With the Built-in mode the software will be installed using the stock uninstaller i.e. no registry files will be uninstalled. Using Safe Mode, Revo Uninstaller will remove the software and its registry files too, but the only ones that are safe to delete. This is the fastest mode for uninstallation.